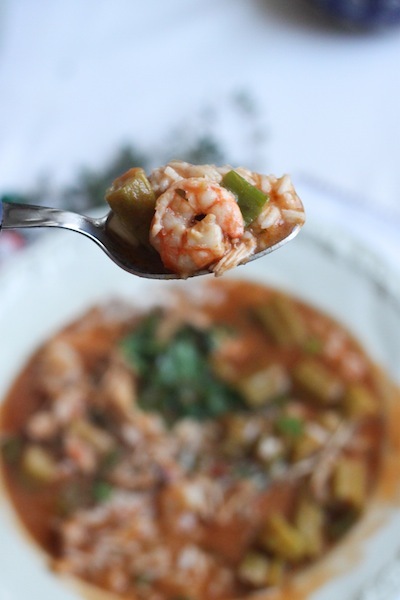 A Winter Slumgullion: Chicken & Shrimp Gumbo – Eat Me. Drink Me. That brings me to this little gem of a word: “slumgullion,” whose meanings are as myriad as what it means: “A meaty stew, a weak beverage, refuse from whale carcasses, a muddy mining deposit.” I mean, wow, what multitudes! Winter itself is a slumgullion of things: grim weather and sparkling snow, stressful shopping sprees and shiny Christmas markets full of gingerbread and Glühwein. There are pretty advent wreaths and piles of cookies paired with all that end-of-year housecleaning that desperately begs to be done before the holidays begin. 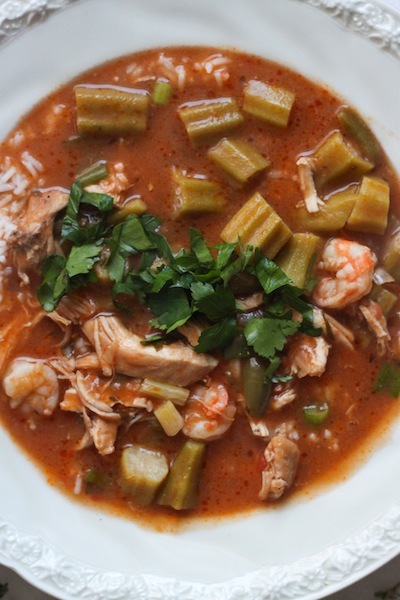 But this winter’s greatest slumgullion was much more literal: a hearty stew à la chicken and shrimp gumbo. 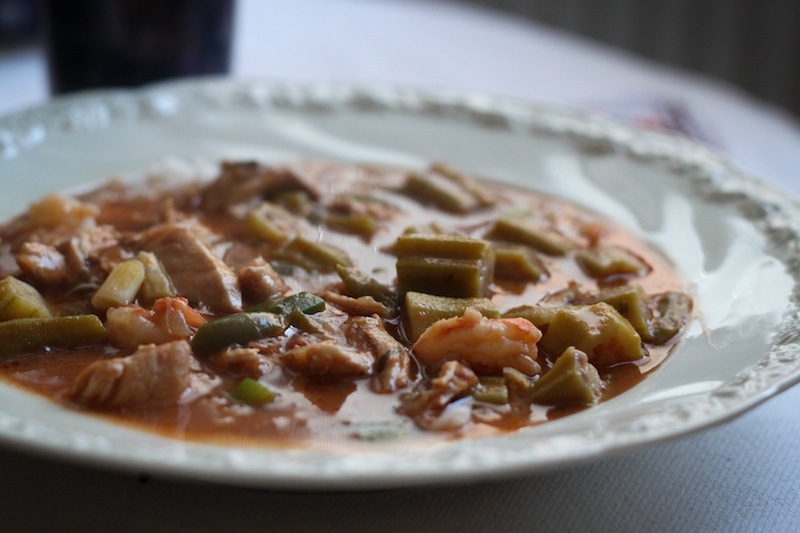 Gumbo is a thick mess of things – tomatoes, onion, okra, scallion, chicken, shrimp – and had I been able to find good smoked sausage and tasso ham, I would have thrown them in the pot as well. 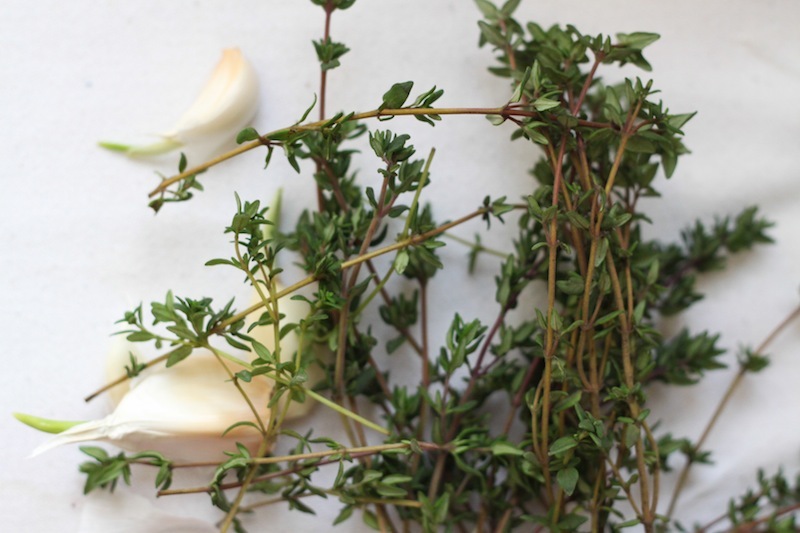 It simmers a long while on the stove, filling the kitchen with the woodsy smell of thyme and the warmth of garlic and bay. It isn’t fancy; it’s comfort food. Something I’m sure that miner would appreciate after scrambling through his muddy deposit. Tomorrow morning, I’ll board a plane and head back to my ancestral land, listening as my language changes, just slightly shifts, adapting to an American ear. And yet, my life here has crept into my speech in ways that won’t quickly be erased. There are direct translations from German into English that sound perfectly fine to me, like adding “or?” to the end of a sentence instead of “right?”: “You’re coming over later, or?” And then there are those Spanglishisms I’ve picked up from David. But it’s fine and nice. I like the way my language reflects my life. It shows me where I am – just like my little black book shows me where I’ve been and where I still want to go. 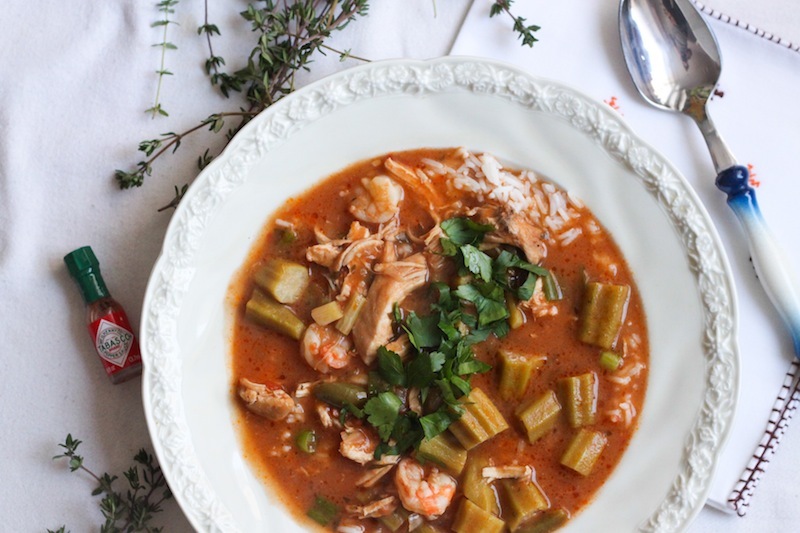 As I mentioned above, I think this gumbo would be great with some smoked sausage (or Kielbasa) and tasso ham (bacon would even be a fine substitute, since tasso’s main contribution is flavorful fat). If you think so too, cook tasso/bacon in the oil before you cook the chicken and cut at least 1 tbsp. of butter. Add the sausage when you return the shredded chicken to the pot. 5-6 servings. 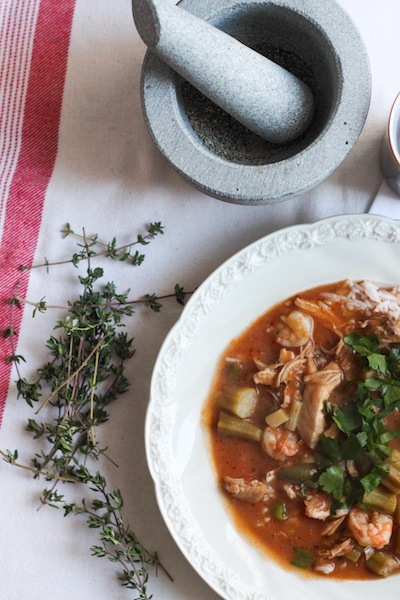 Heat vegetable oil in a deep pot or Dutch oven. Season chicken breasts with salt, pepper, and cayenne pepper, then add to hot oil. Brown on both sides (about 5 minutes per side), then remove from the pot. Turn heat to medium. Add 3 tbsp. of butter and melt it in the oil. Gradually add flour, whisking constantly to make a roux. Cook for about 10 minutes, continuing to whisk constantly, until caramel-colored. Take roux off the heat and allow to cool for about 5 minutes. Return to medium heat and add remaining 2 tbsp. of butter. Once the butter has melted, add onion, green bell pepper, garlic, thyme, and bay leaf, and cook for about 10 minutes, stirring frequently. Add parsley and Worcestershire sauce, then whisk in pureed tomatoes. Gradually whisk in chicken broth to avoid clumping the roux. Shred the browned chicken and add to the pot. Bring mixture to a boil, then reduce heat to medium-low and simmer uncovered for 45 minutes, stirring occasionally. 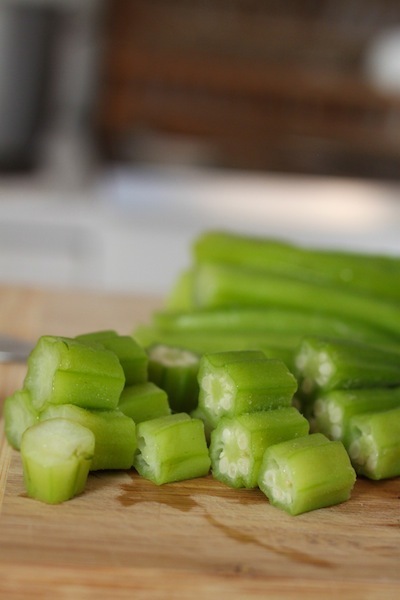 Add okra and continue to cook uncovered for 1 hour. Turn heat back up to high. Add green onions and shrimp and cook for another 10 minutes until shrimp are cooked through. Serve with a healthy spoonful or two of white rice and season to taste with Tabasco. 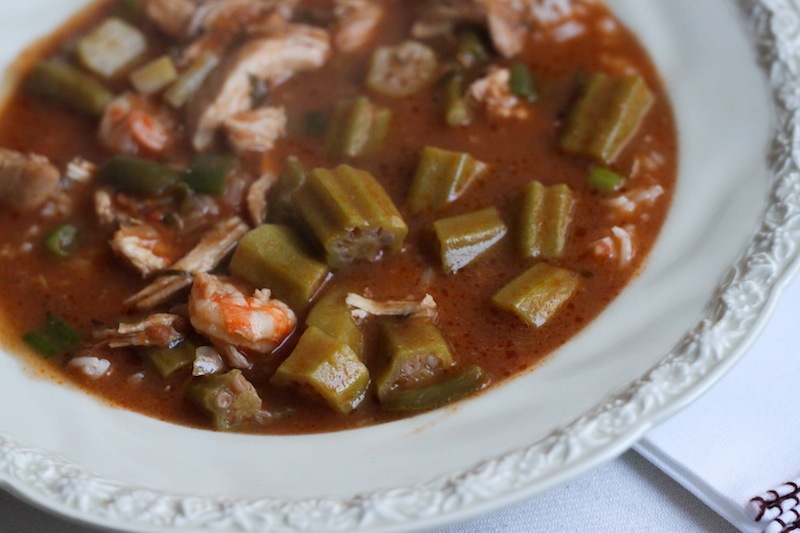 BTW, I had a siroccolificly hot Louisiana Gumbo last night. It was great! “Words, words, words” by Hamlet when asked by Polonius what he was reading.